Dental sealants are continuing to grow in popularity due to their simple application and the high level of protection they offer from tooth decay. In our article, we’re going to teach you about sealants for teeth and how the procedure of applying them works. We will also cover the main pros and cons of the procedure, and the most important facts to keep in mind. What is a Sealant For Teeth? In short, sealants for teeth are a protective layer that is applied to the surface of certain teeth. The most common teeth that sealants are applied to are the primary chewing surfaces found on the molar and premolar area. However, your dentist may sometimes recommend that sealant be applied to additional teeth as well. The sealant itself is usually made from a plastic or resin-like material. It’s typically so thin that users cannot even feel it after it’s been applied. In most cases, the majority of sealant application procedures are completed on small children who are at an increased risk of developing cavities. However, adults may occasionally undergo the procedure as well to help prevent tooth decay. The procedure for applying sealants for teeth is typically quite painless and simple. The first and most important step of the process is to ensure that the dentist is starting with teeth that are clean and free of surface deposits like plaque build up. With this in mind, the most common time for sealants to be applied is after a thorough cleaning by a dental hygienist. Once your teeth are clean, your dentist will dry each tooth and use a suction device to remove any extra saliva in your mouth. The reason for this is that each tooth that is being sealed must be pretreated with a special low-acidic solution that helps with the bonding process. Too much saliva would dilute the mixture and result in poor surface bonding. Now that each tooth has been treated with the special solution, your dentist will paint each tooth with the dental sealant mixture. 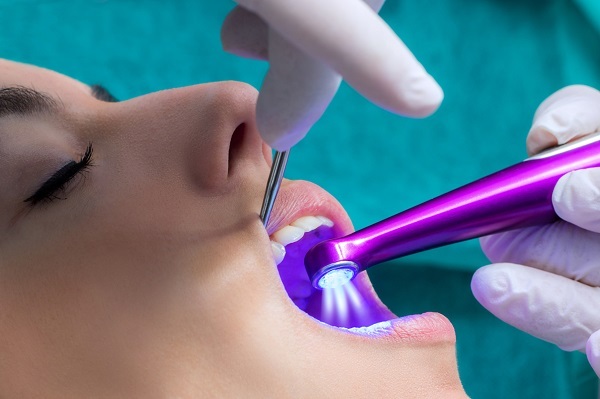 Once the tooth is thoroughly coated, a special curing light is used to cause the sealant to harden rapidly. In most cases, the curing phase takes 30 minutes or less. Once this is done, the sealant application is complete and your teeth now have additional protection from cavities. Now that you have an understanding of what dental sealants are and how the procedure works, it’s time to start learning about sealant for teeth pros and cons. Before we move onto each individual list, we want to point out that sealant for teeth side effects are virtually unheard of. The only side effect that some users have reported is a temporary change in bite pattern. However, this quickly fades as the patient adapts to the feeling of the protective coating on their teeth. Reduced Tooth Decay: The biggest and most important benefit of teeth sealants is that they help reduce tooth decay. Your teeth are constantly assaulted by acidic compounds from citrus products, sugar, and more. The protective layer helps protect your delicate enamel from all of these dangers. Surface Plaque Adhesion: Sealants can also help reduce surface plaque count by reducing the surface area that they can adhere to successfully. The smoother a surface is, the harder it is for plaque to form and to hold on successfully. Painless Procedure: Another huge benefit to dental sealants is that the procedure itself is quick and painless. In most cases, your dentist should be able to complete the sealant procedure in 30 minutes or less. False Sense of Security: One of the biggest pitfalls of dental sealants is that they lull patients into a false sense of security. While they do help prevent cavities, they are not a substitute for good flossing and brushing habits. Insurance Coverage: With most dental insurance plans, sealant application for children under the age of 18 is typically partially or fully covered. However, adults are often left paying out of pocket for the procedure. The exact amount can vary, with an average cost of $40 to $60 per tooth. BPA Concerns: One of the main cons of tooth sealants has to deal with BPA exposure risks. In most cases, the plastic material used in sealants contains BPA. Although there are alternative sealants available, the BPA versions tend to offer the best in terms of adhesion and durability. As you can see, dental sealants have a lot to offer. However, there are certain facts that you should keep in mind to ensure that you get the most out of them. First and foremost, dental sealants are not an alternative to proper brushing and flossing habits. While they do help reduce the risks of tooth decay, you must still do your part and make sure you are brushing and flossing in those hard to reach areas. Secondly, the sealant is not permanent in nature. Depending on your unique bite and other individual factors, they may need to be reapplied every five to 10 years. This amount can also vary based on the type of dental sealant your dentist uses. Ask your dentist about how often the sealant should be reapplied to ensure that you maintain your protection for as long as it’s needed. For those of you who are concerned about BPA exposure, bear in mind that the typical rise in BPA levels seen after sealant application tends to drop back to baseline levels in 48 hours or less. The level of protection that dental sealants offer in the long run is more than likely far greater than the slight increase in BPA serum levels. If you’re still concerned about this, consider talking to your dentist to see what other sealants they offer that are BPA-free. After reading this article, you should have a basic understanding of how sealants for teeth work. For best results, just remember to keep brushing and flossing like normal. In addition, you can always consult with your dentist to determine if dental sealants are right for you. If you have any thoughts you would like to share, feel free to post them in the comments area.